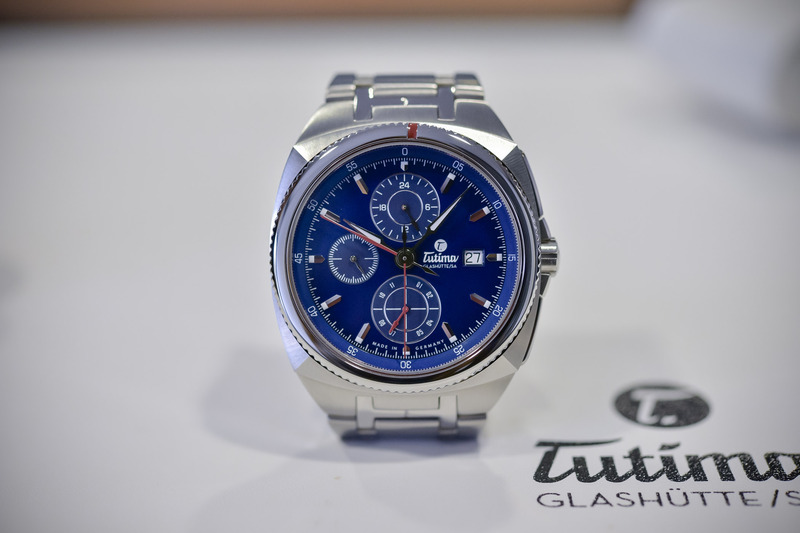 Tutima is a brand that, until recently, was mainly known for two things: being located in Germany’s temple of watches, a.k.a. Glashütte, and for being a provider of quite cool Flieger watches (WWII-inspired pilot chronographs). Yet, things are changing at Tutima, as we’ve seen with the superb Tempostopp and Patria, or with the recently introduced Saxon collection. 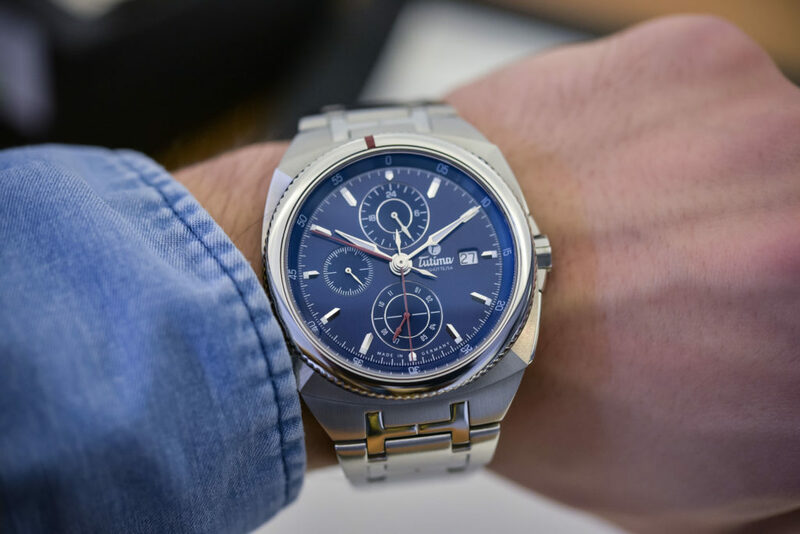 This watch, the Tutima Saxon One Chronograph is now available with a blue dial, adding to the model’s overall contemporary look. We take a look at this sporty, yet elegant time-stopper. Named after the region which is home to Tutima (editor’s note, the brand was founded in Glashutte, Saxony, in 1927), the Saxon one is a modern, streamlined, cushion-shaped chronograph featuring a centre-chronograph minute-hand, an inexplicably rare and useful function – especially in terms of legibility. 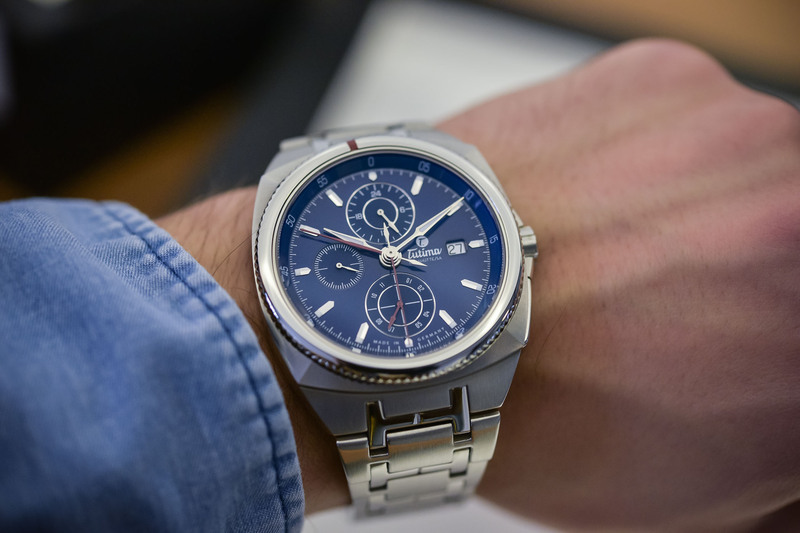 Alongside the white and anthracite dial, it is now available with a striking, vibrant blue dial. Note that this model also exists in a feminine version, which was reviewed by Roberta here. Blue-blood – If the watch itself is technically identical to the existing model, the new “Royal Blue” dial adds a definitive touch of nobility. The shade of blue sits somewhere between navy and midnight blue; the dial features a balanced layout with faceted hour indexes, sub-dials with metallic rings and printed white markings. The minutes are indicated on the flange presented in a similar blue. It is paired with elegant hour and minute lance-hands. 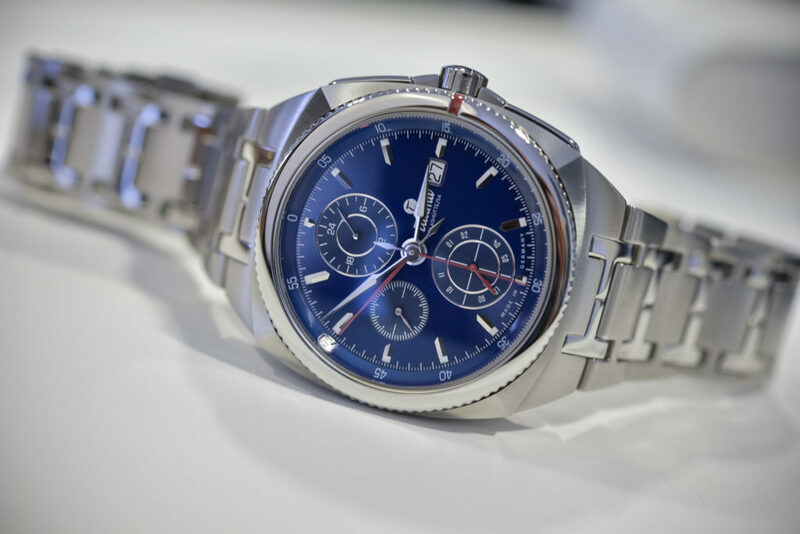 The chronograph hands are presented in contrasting red (for the central-second, the central-minute and the 12-hour counter at 6). Some luminescent material allows for enhanced legibility in the dark. The Saxon One Chronograph is powered by the Tutima calibre 521, based on the Valjoux 7750. 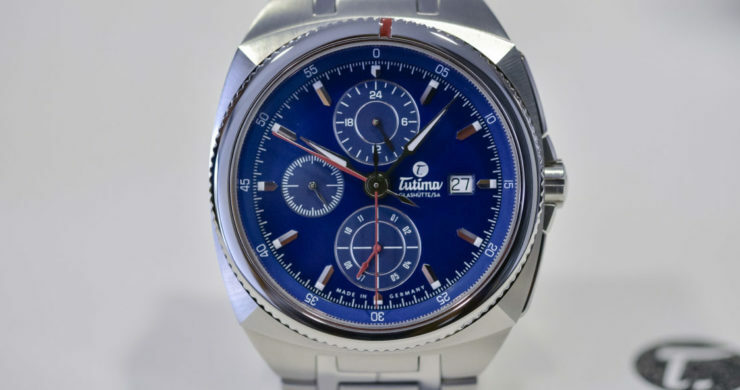 However, the ubiquitous, legendary workhorse chronograph is substantially modified by Tutima to mimic the functions of the Lemania 5100, which has been in use for a long time at Tutima for its military chronographs. A useful feature, the central minute indication is intuitive and can be read at a glance (unlike for traditional chronographs that have legibility issues with their small sub-dials). 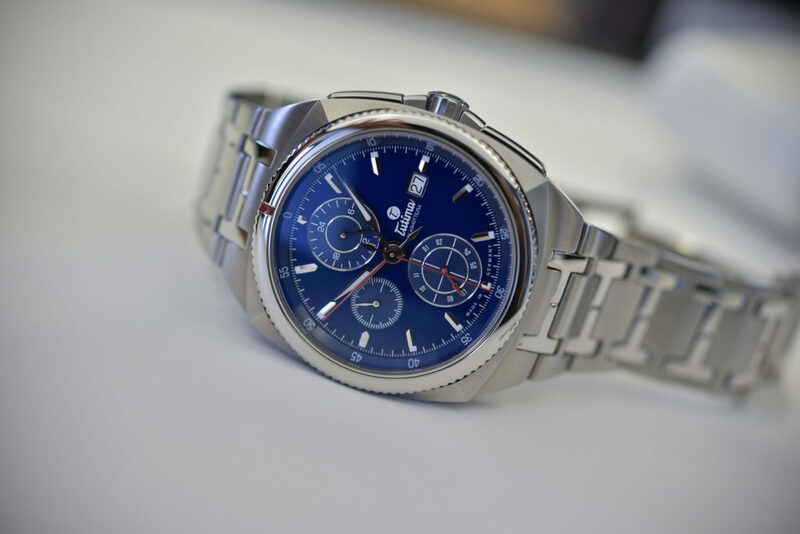 A feature too-long reserved to pilot watches and that is now used on a luxury sports watch. Clever and in line with the brand’s DNA. Note the presence of a 24-hour indicator at 12, which works as a day-and-night function. Sporty and elegant at the same time, the Saxon One is characterized by its dynamic and architectural cushion-shaped case. It features a distinctive pyramid-shaped bezel and domed sapphire crystal. The flat chronograph pushers are integrated into the case band, providing a clean look. The rotating bezel features a red mark that can be aligned with the minute hand to time a given event. Crafted in steel and measuring 43mm in diameter, it features a screw-in crown and its water resistance is rated to 200m (more than sufficient for 99% of the future owners). 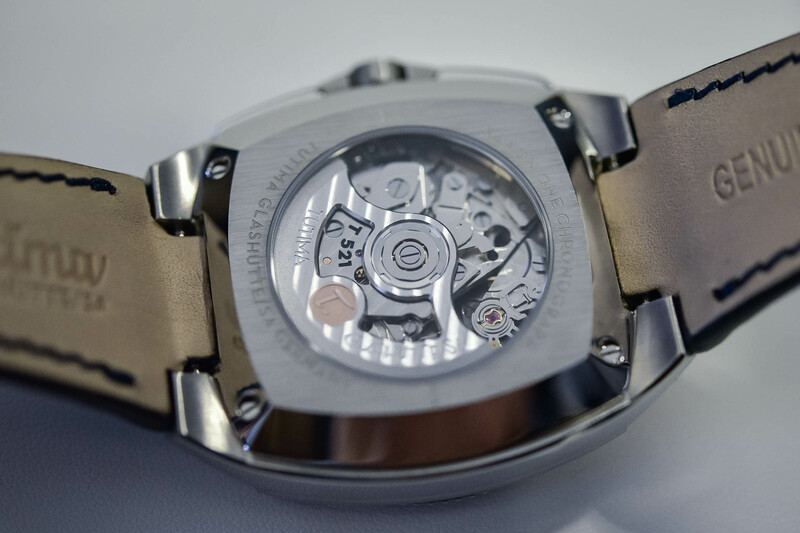 Turning the watch over, the exhibition case-back offers a nice view on the automatic movement, with its distinctive cam-and-lever mechanism. The decoration is quite simple, with the exception of a nice, personalized open-worked rotor. The seamless integration between the case and the bracelet with H-shaped links makes it comfortable to wear. It is also available with an alligator strap, secured with a folding clasp. For more information, visit www.tutima.com.